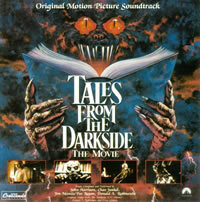 GNP Cresendo presents the original soundtrack to the 1990 feature film of TALES FROM THE DARKSIDE starring Christian Slater, Blondie, Julianne Moore, James Remar and Rae Dawn Chong.The story presents three vignettes that are all tied together with a "wrap-around" story concerning a witch, Betty, who has kidnapped a young boy, Timmy, and holds him prisoner. Betty plans to roast him in her oven and serve him at a dinner party for more of her witch friends. To pass the time in his cell, Betty had given Timmy an old, thick book called "Tales From the Darkside". When she reveals her plans for him, Timmy begins to stall her by reading her some of the stories. The music was composed by John Harrison.